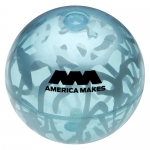 Do you want to have a ball during your promotional campaign? If yes, you should order our best seller custom beach balls at Promo4kids.com. These colorful beach balls will make the fun meter of your campaign peak this summer! Beach balls are loved by kids and their parents. Custom printed beach balls are perfect for distribution during trade shows, in-store promotions and birthday parties. 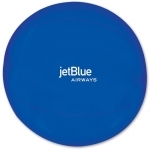 Promo4kids.com offers a wide range of promotional beach balls in various sizes and colors that will make your promotions easily noticeable in the public. Shop today to avail attractive price deals that are unmatched by any our competitors! We offer discounts on bulk purchase, free online design proof, artwork assistance and quick shipping. Do you know custom printed beach balls have been around since 1930's? However, they are still very popular with masses who use them at beaches, picnic spots and many other places. This is why many businesses use these beach balls for promotions. People usually love promotional gifts that keep them entertained and informed about the business that they should consider regularly. If you want to live your campaign and derive maximum exposure for your brand logo, check out our collection of custom printed beach balls. It doesn't matter whether your business caters to kid or not, still you can score with them by printing your brand logo over any of these beach balls. As said before, these beach balls are one of the beach toys and leisure toys that kids and their parents use around beaches and other leisure areas to keep themselves occupied and entertained. At Promo4kids.com, we offer beach balls in different colors, sizes and shapes for your selection. All beach balls are kid-friendly because they are phthalate free. 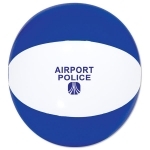 You can team these beach balls with other promotional giveaways for kids such as balloons, rubber ducks and tambourines for added advantage. One Color Beach Balls - Available in various light and vibrant single colors of your choice, you can select them to carry your brand logo. You can match colors with the theme of the celebration or theme of promotions. Available in sizes 6", 12" and 16", you can select them according to your promotional requirements. 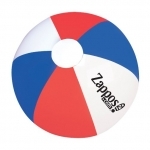 Two Color Beach Balls - Custom printed two color beach balls will amuse kids with their dual colors. You can print your brand logo in the space between designs on both edges for better recognition. We offer attractive discounts on wholesale two color beach balls. You can gift them during any mass promotional event or personal celebrations as well. Multi Color Beach Balls - These multicolored promotional beach balls will bring you easy brand exposure with their colorful design. Perfect way to captivate attention of the audience you want to target. If you are on a lookout for customized products that will offer prolonged exposure for your brand logo, invest in these customized beach balls and bouncy balls today! For any additional information on promotional giveaways for kids, feel free to call our marketing team at 855-454-3786 or email us at info@promo4kids.com.